One of the largest campus buildings houses more than 20 classrooms over two floors and an auditorium, lounge, the ACE Tutoring Center and various faculty and administrative offices. Parking is available in the Yellow and Purple lots. This two-story building in Dardenne Prairie is SCC's newest. Institutional focus is on healthy and sustainable living, with most courses centered on the healthcare field. The Technology Help Desk, private study rooms, a small TV studio and a cluster of classrooms all accompany this two-story building’s main feature, the Paul and Helen Schnare Library. Parking is available in the Blue lot. Located near the South Entrance, this three-story building houses the Welcome Center; admissions, financial aid and counseling offices; administrative offices; classrooms and labs. Parking is available in the Red and Green lots. A 407-seat theater is the central highlight of this one-story building which also houses music classrooms, a scene shop, the SCC Box Office and an art gallery. Parking is available in the adjacent Blue lot. Scooter’s Place, a full-service dining area, is located on the lower level near the Assessment Center and Disability Support Services. Workforce Development and a police academy are on the second floor. Parking is available in the Green and Blue lots. Home to 20 classrooms and the Division of Arts, Humanities and Social Sciences as well as the Continuing Education Department, this two-story building is one of the most centrally located and is accessible from most parking lots. This two-story building is a multi-purpose facility for fitness classes, student organizations, athletics and special events including graduation and other large, community activities. Parking is available in the Yellow lot. One of SCC’s newest buildings is home to the SCC Bookstore and spirit shop, as well as Cougar Café, a grab-n-go food service option open Monday-Saturday. The Café-Bookstore is closest to the Yellow lot. All 20 classrooms in the two-story building highly visible from Mid Rivers Mall Drive incorporate modern computer hardware and software to serve a variety of technology-based instruction. Parking is available in the Orange lot. Situated near one of two campus lakes, this building’s acid-stained cement flooring speaks to the active learning environment inside its 10 art studios for print making, photography, drawing and more. Parking is available in the Orange lot. The Child Development Center is an accredited, not-for-profit child care and early learning facility licensed for 156 children 6 weeks through 8 years. Pickup/drop-off occurs out front, with parking in the Orange lot. Tucked behind the College Center (gymnasium) is the 20,000-square-ft. Campus Services Building. Student IDs and parking passes are distributed in the Department of Public Safety, located inside the building’s southwest doors. A nine-hole disc golf course and separate outdoor fitness trail are the key features of the 80-acre College Meadows Park. The park connects with nearby greenways and is open year-round. Dip your toes in the sand at the outdoor volleyball court. Volleyballs may be checked out with a valid photo ID any time the College Center Fitness Center desk is open. Please read all rules and safety guidelines posted courtside. A stretch along Mid Rivers Mall Drive and Ohmes Rd. provides scenic terrain for a .67-mile paved trail constructed by Great Rivers Greenway. The segment links trails from Cotteville’s Legacy Park with Woodlands Park in St. Peters. A natural amphitheater sits west of Mid Rivers Mall Drive and one of two campus lakes, providing a setting for outdoor movies in the summer and early fall. Parking is available in the Orange and Red lots. Bleachers and lawn seating are available at the men’s and women’s soccer field at the corner of Ohmes Rd. and Mid Rivers Mall Drive. Watch the Cougars compete in NJCAA Division I from August to late October. Parking is available in the Orange lot. Cheer on the Cougars every spring as they challenge their rivals from around the region. SCC is a member of NJCAA Division I and competes in the Midwest Community College Athletic Conference. Parking is available in the Orange lot. Support the SCC Cougars as they take the field March-May, competing with colleges from around the Midwest. SCC is a member of NJCAA Division I and participates in the Midwest Community College Athletic Conference. Parking is available in the Orange lot. Although it's not the physical center point of campus, the Campus Plaza is the heart of SCC outdoor student life and home to events like Fall Fun Blitz, Spring Fling and other music performances in the patio/amphitheater between the Learning Resource Center and the Student Center. Students can purchase their books and enjoy shopping for SCC gear and other classroom necessities at the SCC Bookstore. Adjacent to the bookstore, the Cougar Café provides a grab-n-go alternative to the full-service Scooter's Place cafeteria located in the Student Center. Cougar Café offers a coffee and espresso bar, sodas, snacks and lunch items like sandwiches, wraps and salads. Part of the Phase 4 construction project, the 20,914-square-foot building was completed in August 2006. This building contained 16,000 square feet of space in the first construction phase and was enlarged by 4,000 square feet in Phase 2. It houses central heating and air conditioning, receiving and storage areas, mail room, copying, Department of Public Safety and other essential services. It is separate from the main cluster of campus buildings. The Child Development Center is an accredited, not-for-profit childcare facility designed to meet the needs of young children from the general public as well as children of the faculty, staff, and students. The state-of-the-art facility has a fenced playground, classrooms for infants and children ages 6 weeks through 8 years of age, a kitchen for meal preparation and offices for staff. The Center also serves as a teaching lab for students in the college’s child care and early education program and provides training for workers at child care centers throughout the area. The 6,600-square-foot building was completed in spring of 1996. A separate project from the other six campus buildings, it was built with matching funds from a Missouri statewide bond issue. In spring 2001, a 7,000-square-foot addition to the Child Development Center was completed. Part of the Phase 3 construction project, the addition allowed the college to accept infants and toddlers. Named for the longest-serving member of the Board of Trustees, this two-story building houses a number of classrooms, an auditorium, administrative offices including the president of the college, and the ACE Tutoring Center, where students can work with tutors on challenging subjects. The 87,687-square-foot building was completed in August 2006, and is one of three buildings completed during the Phase 4 construction project. This two-story building named after the college's second president has about 42,000 square feet of space. Part of the Phase 2 construction project completed in 1995, it houses the college's Corporate & Community Development Division including continuing education and community and business programs, the Division of Arts, Humanities and Social Sciences, as well as additional classrooms, offices and storage space for various academic disciplines. The Learning Resource Center (LRC) is the two-story home of the Paul and Helen Schnare Library, Technology Help Desk and the Adult Education and Literacy Department. There also are several classrooms and offices. Part of Phase 1 campus construction completed in late 1995, the Learning Resources Center is about 42,000 square feet. The two-level Student Center contains Disability Support Services, Assessment Center and Workforce Development offices, Scooter's Place kitchen and dining areas, the Eastern Missouri Law Enforcement Training Academy and classrooms. Completed in Phase 1 of campus construction, the Student Center is about 36,000 square feet. All classrooms in this two-story Technology Building, home to SCC’s core of technology-based courses, incorporate the latest in computer hardware and software, and the building is wired with fiber optic cable to allow the full range of voice, data and video in each room. The building also houses offices and student lounge areas. Part of the Phase 3 construction project, the 41,868-square-foot building was completed in time for spring 2001 classes. The Visual Arts Building is home to the visual arts programs; it houses 10 art studios for pottery (ceramics and clay), print making, photography, graphic design, painting, drawing, jewelry making and sculpture. Part of the Phase 4 construction project, the 20,890-square-foot building was completed in August 2006. 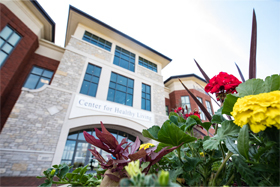 St. Charles Community College’s beautiful 228 – acre campus features numerous walking trails, including the half-mile storybook walk presented by St. Charles City-County Library and the SCC Foundation. Located at 1 Academy Place, Dardenne Prairie, Mo.